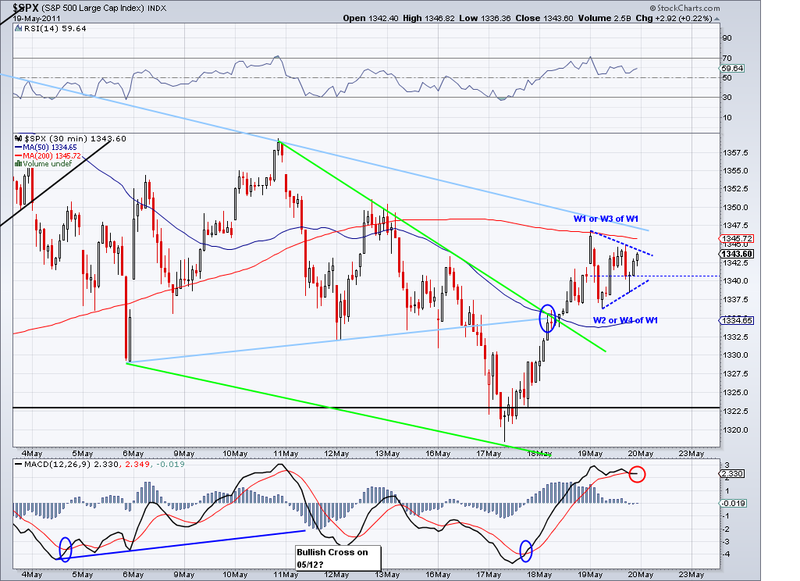 The market is now confirmed bullish again by gapping up over the bearish trendline and closing comfortably over the TA. Commodities rallied as I was expecting and I see this as a new bullish intermediate leg for all asset classes (with the exception of the US dollar). So while the S&P target of 1403 was not reached due to the correction, chances are it will be reached in June IF the market respects the TA and trades above it. I assume these 5 waves will find a top tomorrow or Thurs and then retrace to the TA and then we should see wave that should take us to a new high for the year. 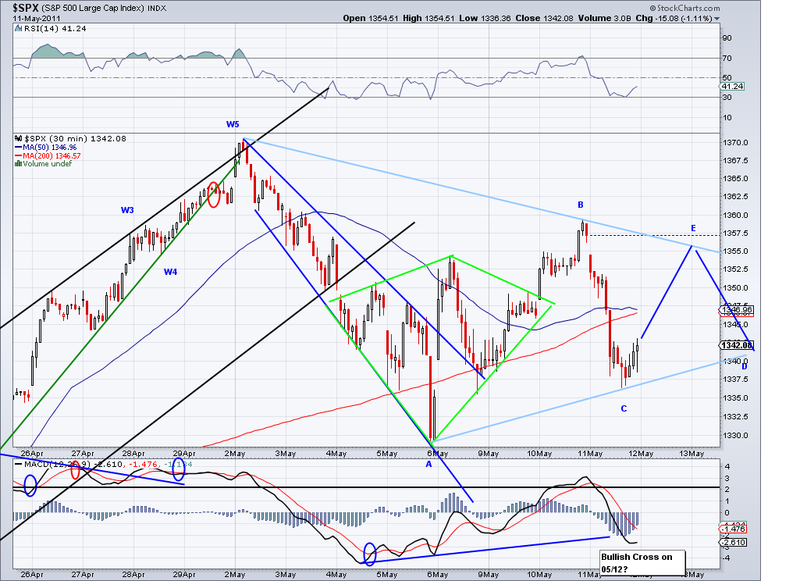 And maybe then we will finally see a Fib retrace for the wave from 1040, an ideal summer correction. I picked up emerging market plays today, mostly EWH (Hong Kong Index) and added to my FXI (China) position which gapped up a lot today. 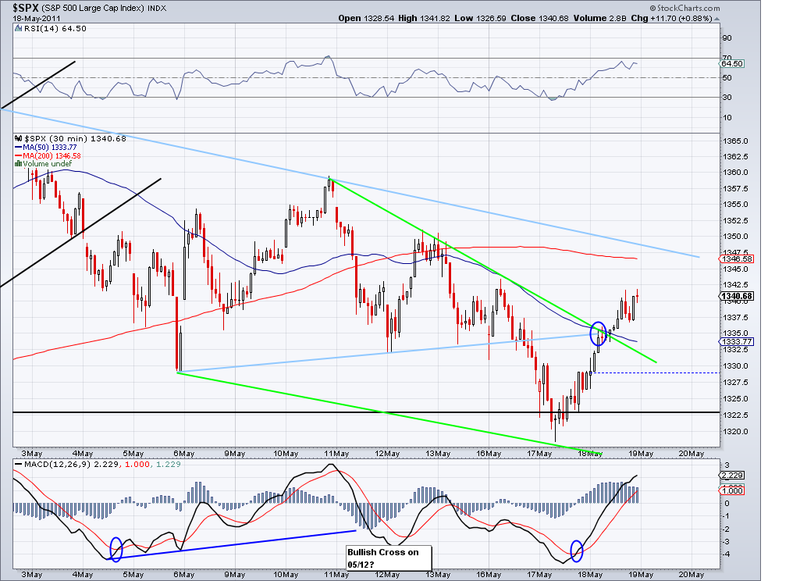 The market closed over the TA today and it is turning the short term trend bullish. However, we need confirmation in the next couple of sessions. 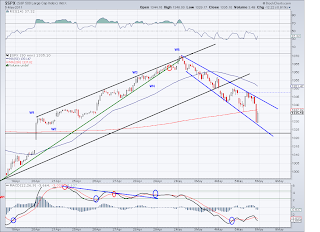 Ideally, the market would break over the upper bearish channel. In the intermediate term picture, I see the market about to start a bullish leg as well so maybe this will be the start of a bullish wave that will last for few weeks. I was tempted to add longs (to my already long position) but I think I rather see the channel break before making the jump. Aside from US equities, gold, oil, silver, and emerging markets are all confirmed bullish and I will start positions next week in EEM, USO, FXI and some SLV. 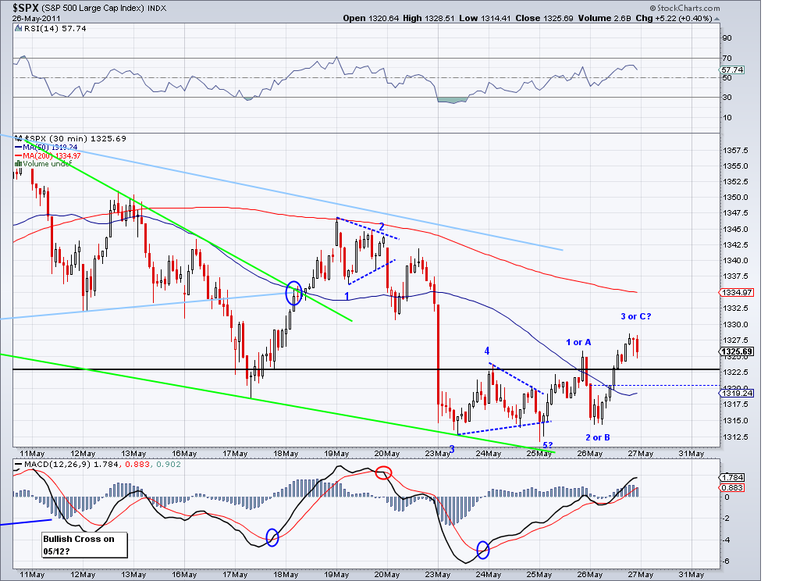 I have my gold positions from few months ago and I will probably cash in when the intermediate bullish wave is done. I also have been working my my site and I will be launching it soon hopefully, the address is http://trendingwaves.com.. have a great weekend! 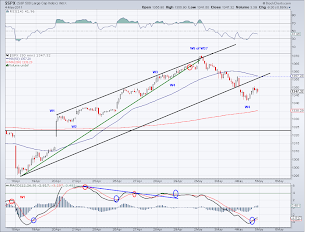 The market tested the TA as I was expecting yesterday and now we shall see if this is a C wave, which implies a sell off in the next couple of sessions or a W3 that will break through the TA and turn the trend back to bullish. In looking at commodities and emerging markets, odds favor the start of another rally and if that happens the S&P will rally along with it. 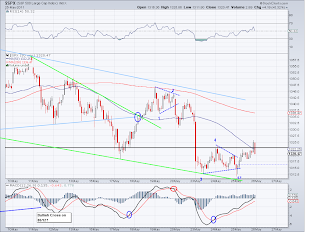 I am ready to add to longs should a break out occur. The selling that occurred after hours failed to show in the cash index. The market bounced off support and rallied from then on. 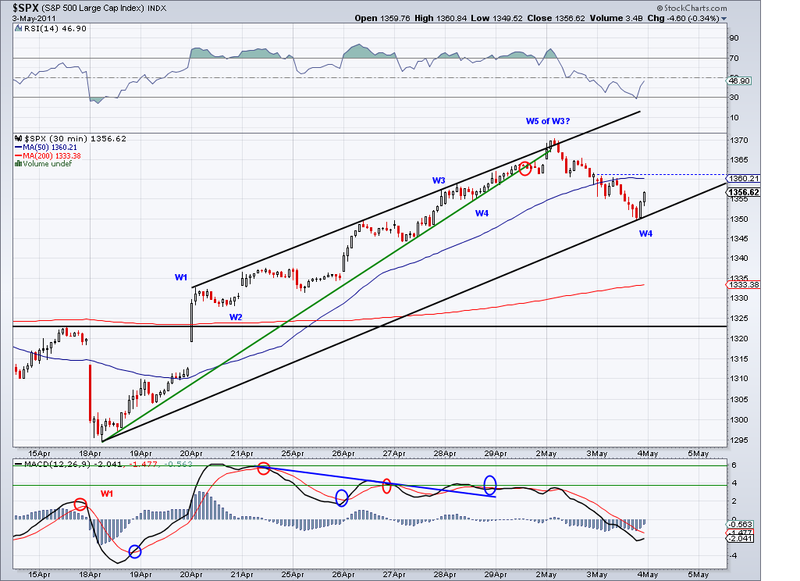 I think we are going to see the TA (currently at 1329) tested again on this counter rally. If the bulls are able to make the market close above the TA then there will be a chance to turn things around. 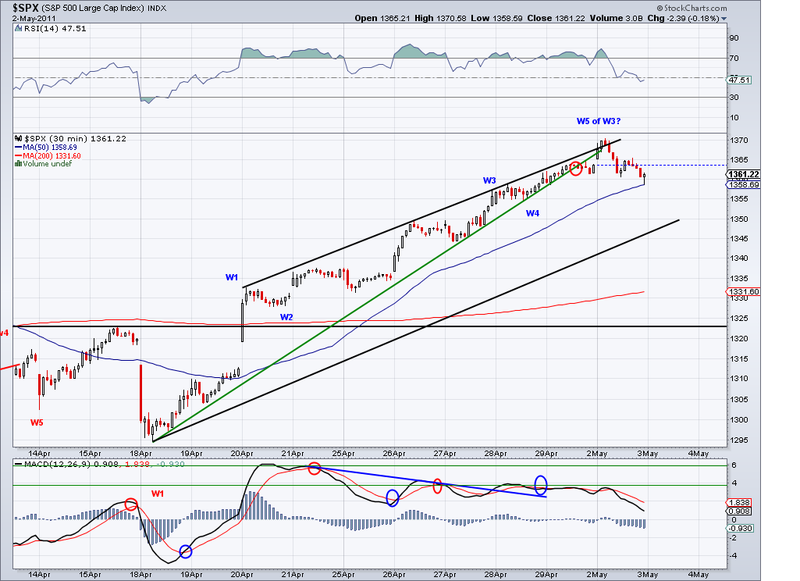 But as of now, the trend is bearish and any rally should be considered a counter rally until proven otherwise. With that said, it looks to me like commodities are going to go bullish again and if that happens we will see a resumption of the bull market. The market couldn't counter rally much as expected in a W4 situation and now it seems like we will see the start of the bearish 5th wave as soon as tomorrow. In fact, we might gap down from looking at the set up. The support level might actually be a good place to go long with the test of the TA as a target. 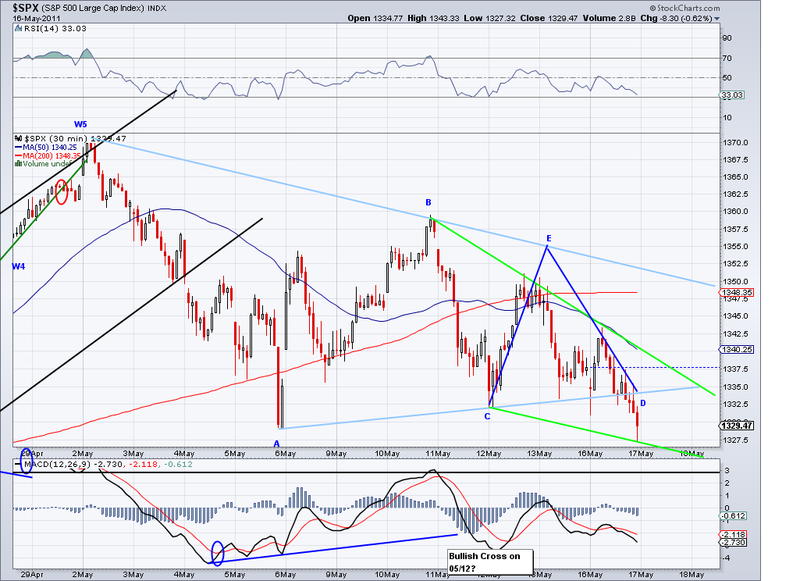 But we have to see how the market opens tomorrow, my guess is that it will probably test 1301. On the other hand, commodities are starting to recover so the market will soon have an excuse to start another rally. 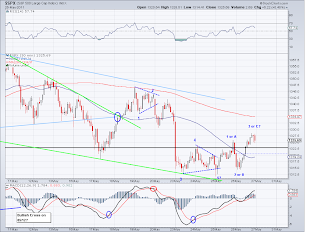 The short term bullish scenario is now out after the sell off today. What we saw last week was just a test of the TA and the market had no intentions of staying above it, so for now the correction continues. The 1317-1319 level broke and there is some support at 1312 but ultimately 1301 might be tested before this particular bearish wave is done. Then intermediate term has turned bearish too so we might see the entire wave from 1040 might finally retrace to a a Fib area, this wave never did the retrace and every single correction has proved to be minor ones. 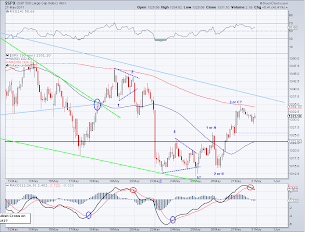 So if this is the corrective wave then the 1165-1244 (worth noting the 200 SMA is at 1239 so it would be a good test) area will be visited and in the process invalidating the intermediate Inverse H&S I posted last week. 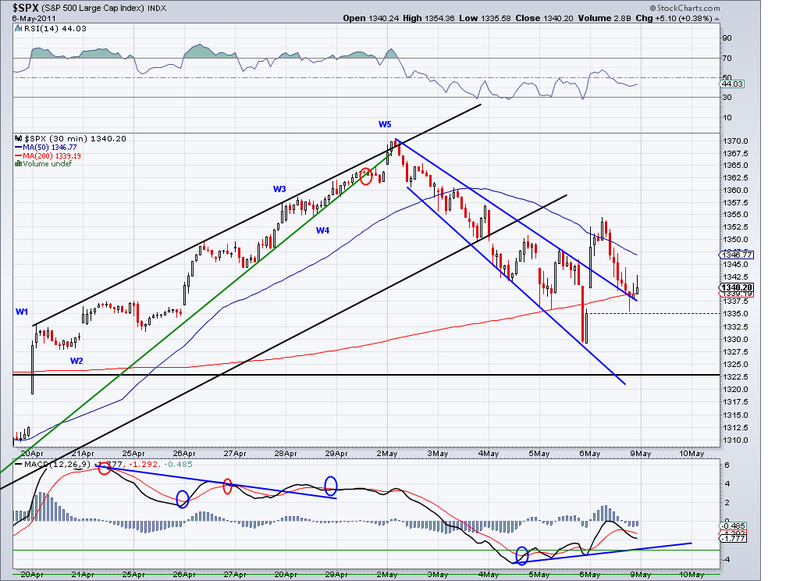 But for now, the market is again oversold and should be getting a bounce as soon as tomorrow or Wed again. If the bounce stalls at the TA again, expect 1200's.. 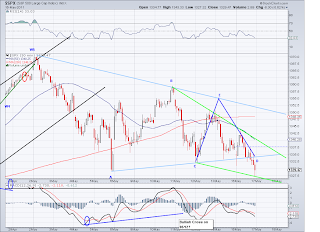 The market rolled over and started the bearish wave I predicted yesterday and now it remains to be seen if the bullish formation wave will resume on Monday. 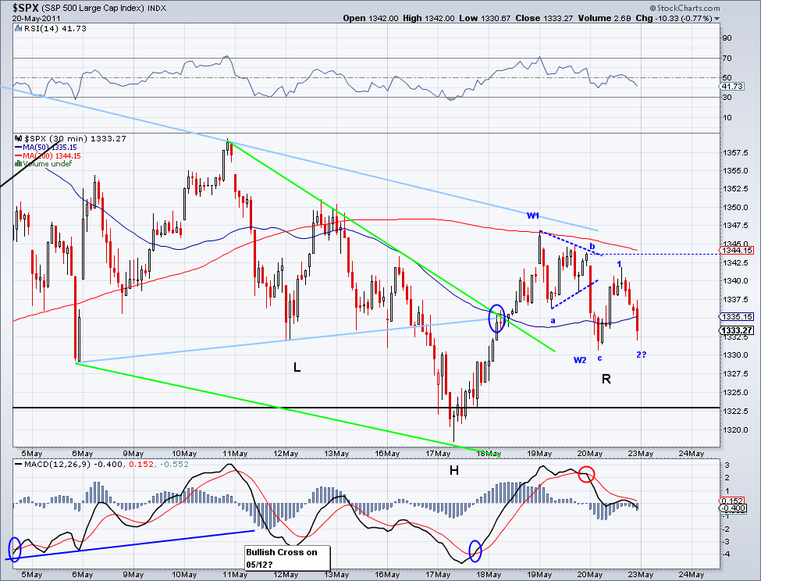 Today's market action created another inverse head and shoulders targeting 1377. The close under the TA is obviously negative but the bullish channels are still in place as the selling today held at support levels. And unless these key support are taken out then we will have seen a bottom in the near term future. Furthermore, it looks like the correction in commodities is nearly over and that favors more upside for equities so we'll just have to see what next week has in store for us. The close today above the TA confirms a change of trend to the bullish side so perhaps we are witnessing the beginning of another rally to a new high. And like everything else in Technical Analysis, nothing is 100% certain so what I expect is for the market to start a bearish corrective wave tomorrow or Monday that will fall in the Fib retracement area of the this wave from 1318 and then resume another even more bullish wave. With that said, if the market goes back down to 1317 support or lower then I will continue to assume we are still not done with the correction. The TA will probably breached again in the next bearish wave but it will then serve as an excellent entry point when the market crosses it on the bullish again. The market rallied as I was expecting from yesterday's analysis and it managed to test the TA which is served as resistance. The close today is slightly right under the TA which is 1341 today. For this wave to become the start of a real rally we have to see follow through rally tomorrow and a solid close over the TA. Anything that bounces off the TA is just a test and a counter rally at this point. 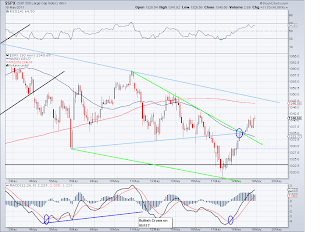 Note the market was able to break away from the the upper green bearish line and the next hurdle will be the blue trend and resistance at 1351. 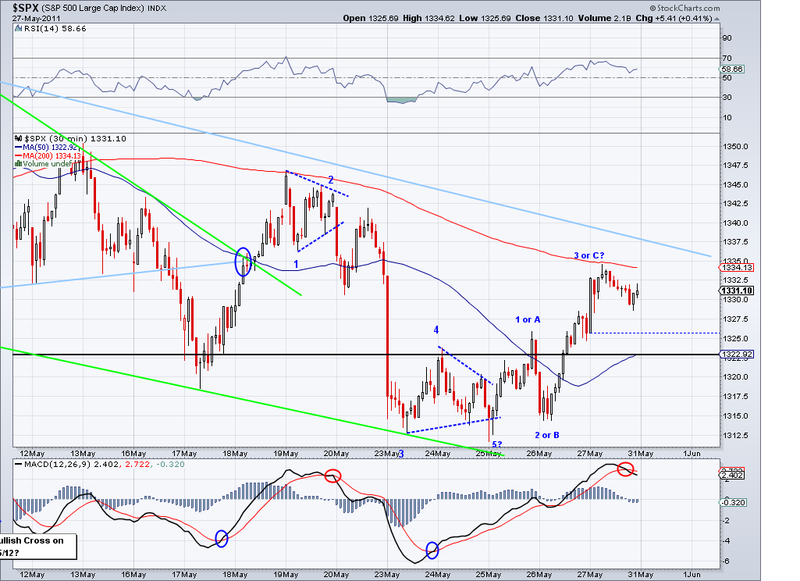 I think as long as commodities keep rallying and the dollar keeps weakening, the equities rally will continue. 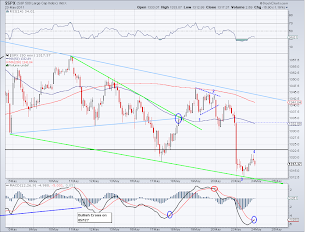 The market held the 1317 support level and there is a bullish crossover on the MACD in an oversold condition. So I wouldn't be surprised if we get a gap up or a rally tomorrow. 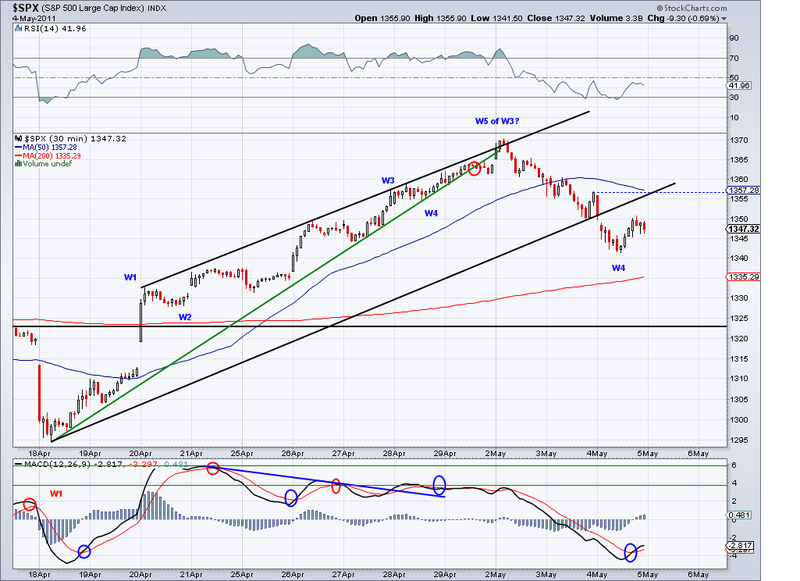 However, in order for this rally to become something more than a counter rally, the market needs to overtake the TA at 1340 and close above it. The short term is bearish and the intermediate has turned neutral leaning bearish so the coming rally should give us more clarity on where the markets are headed next. If I am wrong on the rally, the 1317 support level needs to hold and if that is broken then expect I expect 1309 to be tested. I have my long positions and will be watching the coming bullish wave for volume and other clues to see if we are on our way up or more corrective waves. Support Collapse or End of Correction? 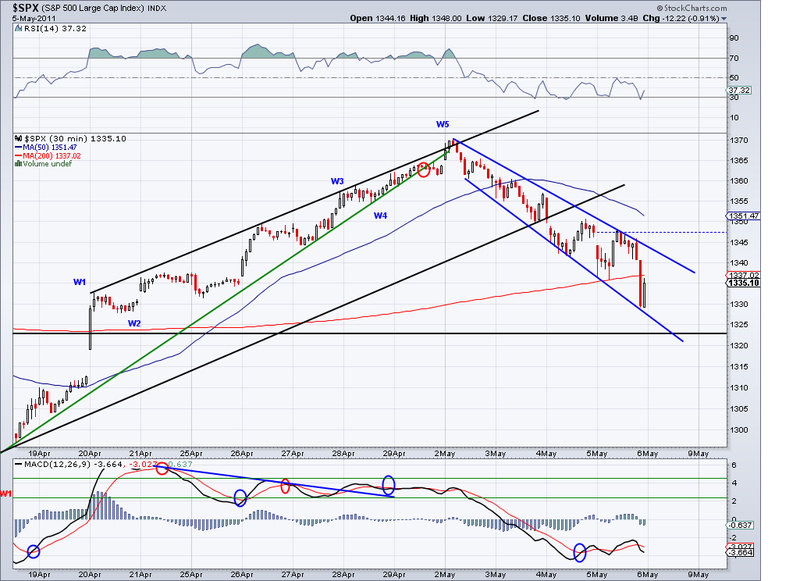 The market was not able to hold the 1330 support level and the close today turns the market bearish. 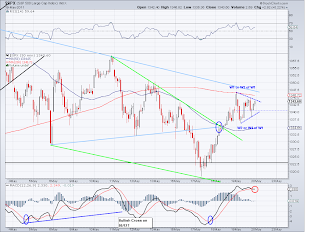 The positive bullish signal on Friday was negated by the reversal later in the day and it seems like unless the market can overtake the TA again, the next target is 1317. 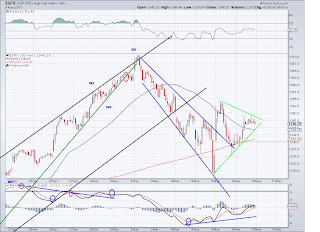 The pattern that I was watching broke but in turn it is creating what it looks like a descending wedge, which is a bullish patter. 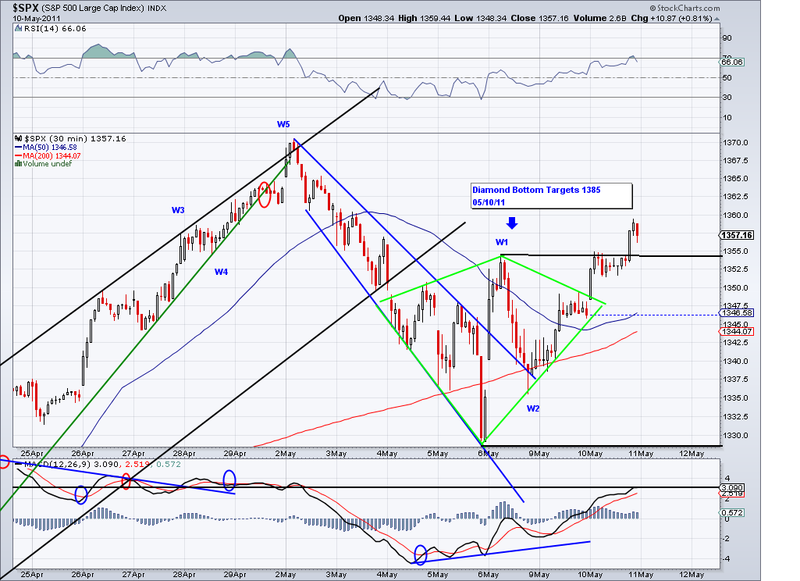 Also, I posted the the intermediate chart so we can see where we are in the overall picture. Short term is definitely bearish but looking at the intermediate chart the recent negative action looks like an obvious correction and not part of a sell off. Note the market has respected the rising trendline of the triangle which it broke out of last month so unless these support levels collapse, we can expect much higher prices when this is done. I find it interesting how the market turned from very bullish to bearish without much reason. The catalyst is supposed to be the commodities sell off and the strong dollar so we have to see how the market will react when these asset classes resume their rally (and yes I think they will keep going up). I wasn't able to update the blog yesterday due to problems with blogger's system. And I hope some of the posts I was working on another project did not just get lost as I don't see them anymore.. makes you think twice about storing information using cloud computing. Anyway, the market has been in a correction and so far it has been trading in the range I drew couple of days ago on the chart. 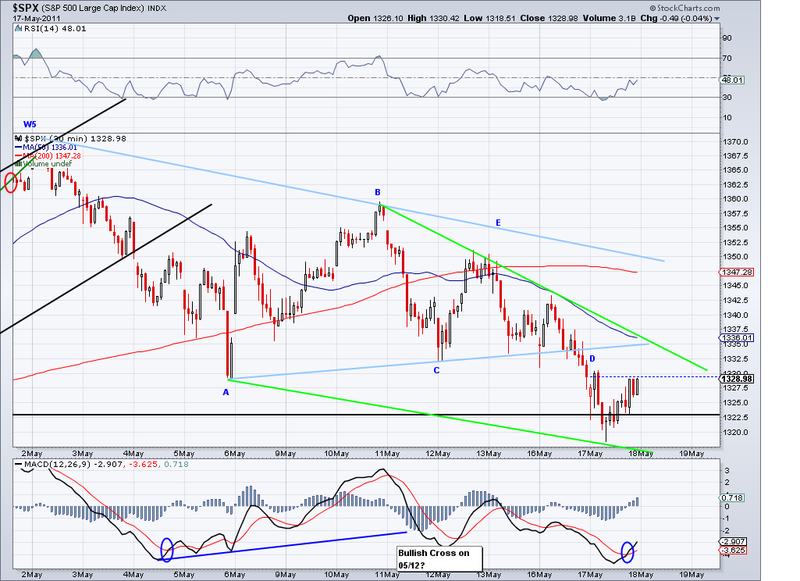 And I am suspecting there will be a break out to the upside fairly soon (hope so since I am long). There is actually a buy signal using moving averages in the short term despite the market closing under the TA, so I think any trades over the TA at this point could signal the beginning of another rally. Commodities, oil and FX have all corrected nicely but I think the sell dollars and buy everything mentality will be back fairly soon. Whenever a currency is debased, everything else goes up.. simple as that. 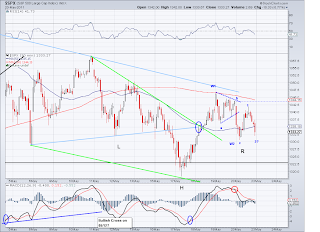 The option I posted yesterday is out as the market failed to confirm the bullish breakout of the pattern and closed under the TA. 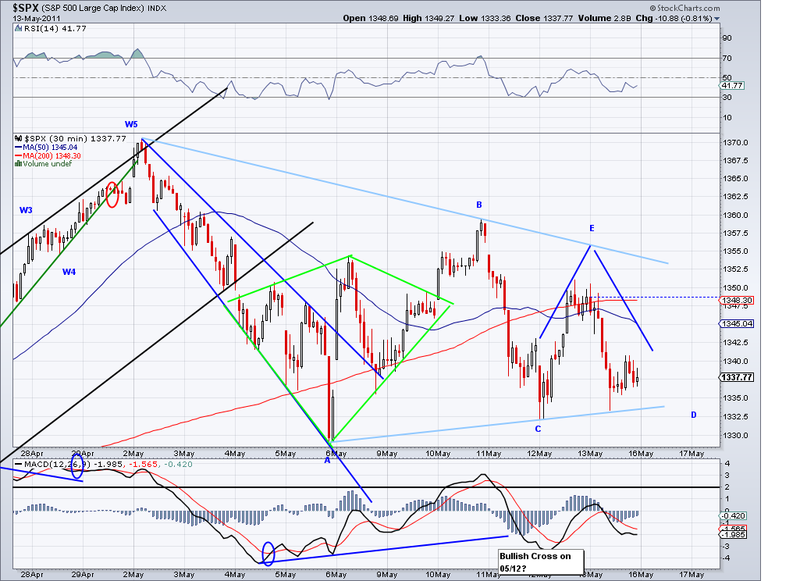 However, the low today is another higher low and there is a good probability of a corrective triangle pattern. Today's sell off in commodities continues to be correction imo so once oil, metals and other assets settle I think we will continue to see a rally in all asset classes due to the dollar's depreciation problem. I got stopped out of half of my leveraged long position, so I'm 100% long now on SPY (on my trading account). I did however allocate about another 10% of my portfolio in GCX which is a diversified China ETF. And if commodities correct another 15-20%, I will add another 10% to Oil, Silver, Copper and Grains. 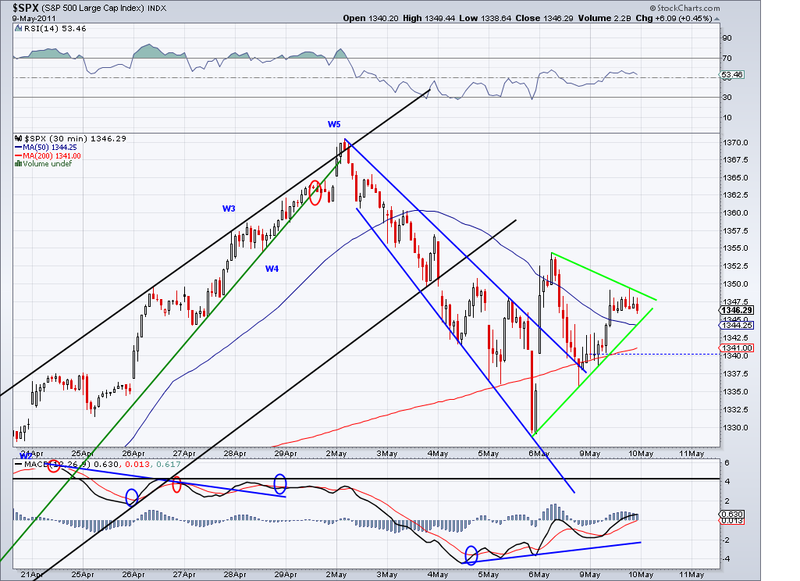 The market broke out of the triangle today and in the process captured the TA. So this shows more clarity of where the market is headed next. 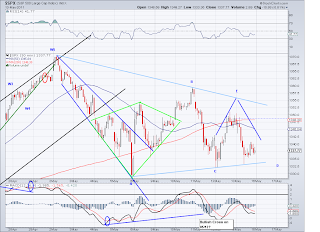 I labeled the waves and unless the market proves me wrong, this is a W3 wave in process. 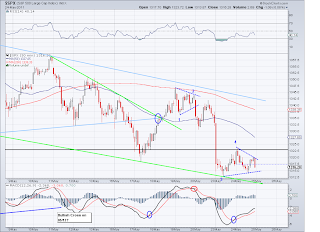 Also, the pattern that was formed is a Diamond bottom which effectively now targets 1385. We would need confirmation on a rally with stronger volume to solidify this pattern so we'll see what kind of day we get tomorrow. I went 200% long today at the close and I'm using the TA as my stop loss for half of the position. Also, I did some calculations and as long as the TA does not get closed under in the next 20 days. I see the market reaching 1400 this month, 1403 to be exact. 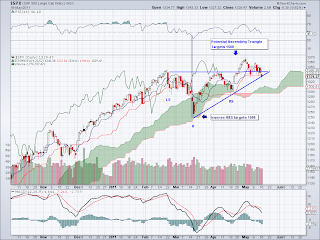 The market seems to be consolidating at this point as it keeps making higher lows. 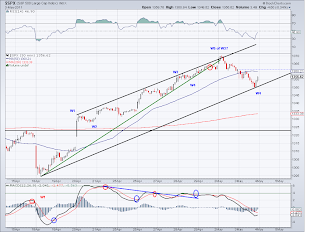 However, the close is still below the TA so the market could well be just taking a breather on further selling. 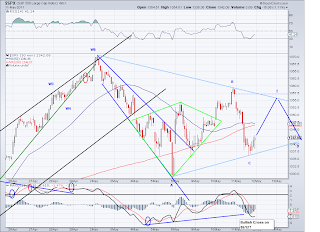 But given the overall intermediate pattern of the Inverse H&S and the triangle breakout, I think we are going to resume the bullish wave as long as the market respects the higher lows and overcomes the TA. I already have long positions in place and will add as soon as the TA becomes positive again (right now is neutral-bearish). The market broke out of the bearish trend today to test the TA and it closed lower after closing the gap from early morning. Technically speaking the market could be setting itself up for a big up day on Monday but given the overall short term negative trend it's a guess at best on which way the market will go next week. If the market keeps testing the TA and making higher lows then we can assume there will be a new high to come. 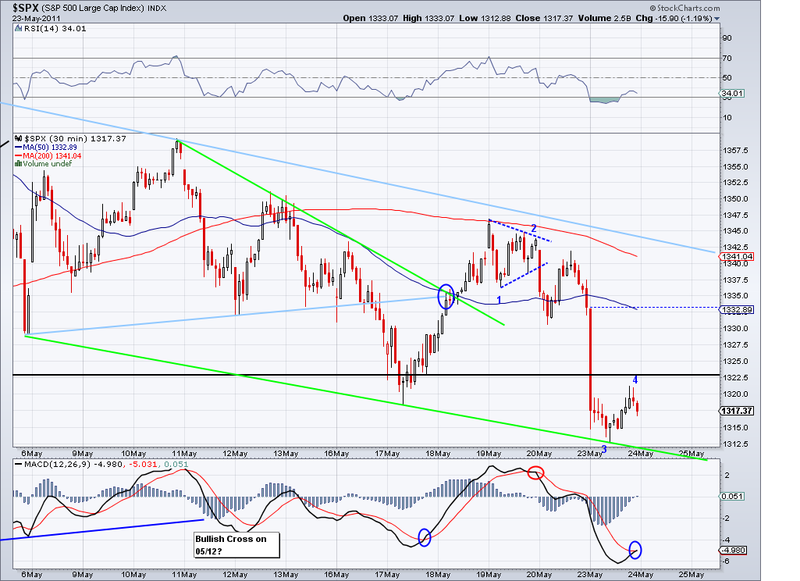 For the bearish scenario to really gain momentum the market would need to break the weekly low of 1326. I am holding my longs in the meantime. I think the government is having the cake and eating it too since it has the liberty to print money (there are willing lenders at low rates) to fend off any kind of slow down while making US made goods and services more attractive by depreciating the dollar. Technically, it's a win/win situation and markets should continue to rally in all asset classes. 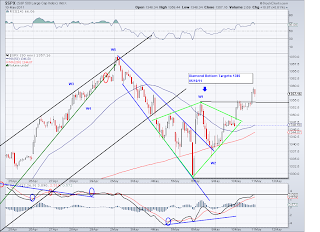 The 4th wave I was looking for is out of the question at this point and not it seems like we are in the process of correcting the wave from 1294, which technically would be a W2 of a W3. A mechanical TA system would have told us to sell as soon as it broke yesterday but because I am trying to minimize "whipsaws" by using Elliott Wave and the MACD, I held on to my long position. 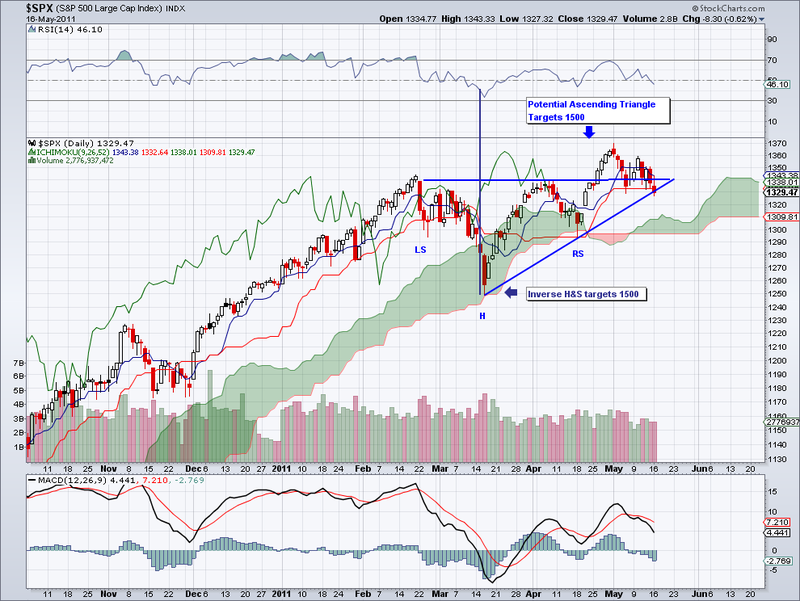 I was wrong in assuming a final 5th wave that would have recaptured the TA. So now I have a trapped position that I might or might not sell depending on how we test the TA at this point. The short term is now confirmed bearish so we'll probably be in this correction for a while before going up again. 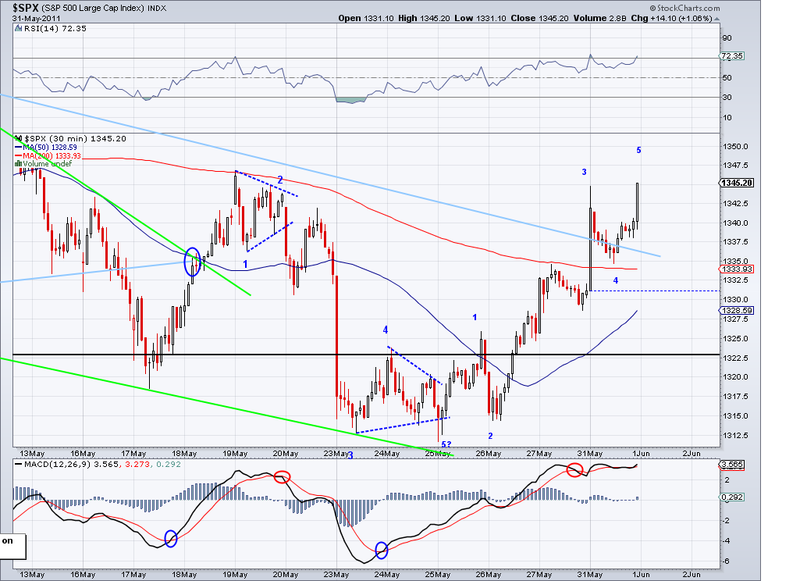 The commodities and FX sell off today is in my opinion just a correction from overbought levels. The long term trend remains firmly positive and I think we'll see some good opportunities in metals and oil once it's done correcting. 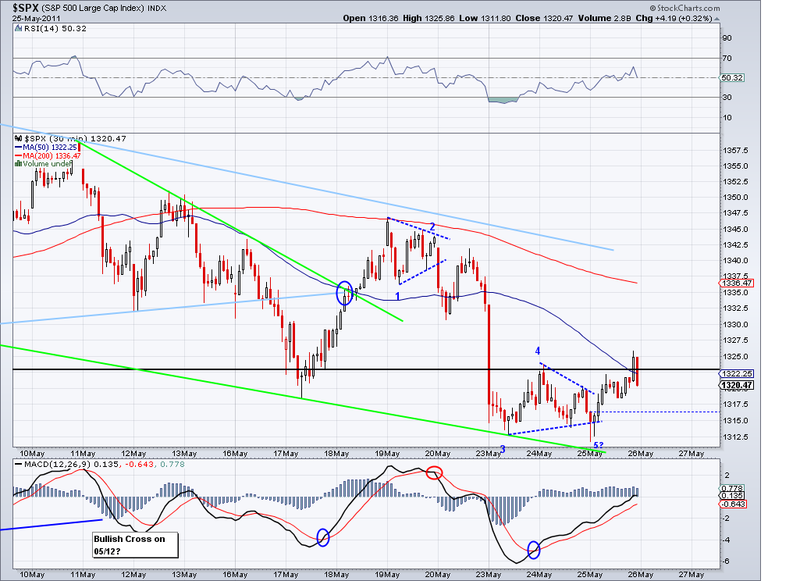 I will post entries for Silver, Oil and Gold when their trends turn up. 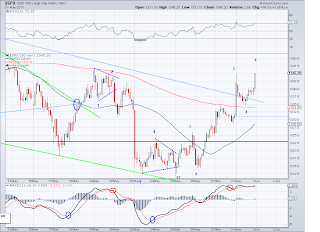 In the meantime, I'd stay away from trading them as they are highly volatile in a bearish wave that started on Monday. 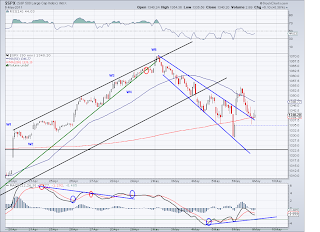 The market corrected a bit further today and closed under the TA, which is a short term bearish sign. 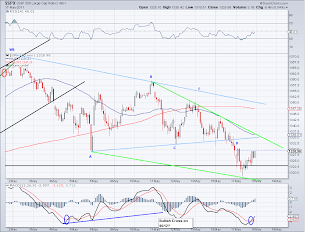 But given the fact that there is bullish MACD cross and this correction was expected (look at the divergence), I lean towards a bullish wave coming as soon as tomorrow so I am holding my long position. The dollar has made a new 3 year low but commodities sold off, so that is just a sign of a correction and it is opinion that commodities will keep going way up once this correction is over. There is no escaping the weak dollar as investors don't really have that many options to put money into. 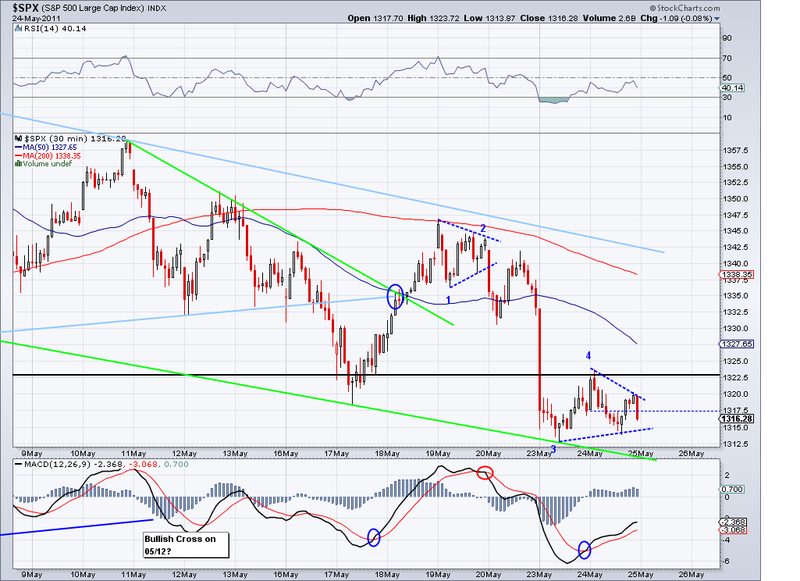 So maybe when the correction is over on that market, I'll post some entry points for Silver and Oil. I already have Gold from 1300's but I am not selling any of it. If anything, I am looking to exit all US dollar positions as soon as I get the chance with the exception of my S&P500 trades. The market tested the TA and the lower rising channel trend and I think this particular correction is now over. If this count is correct then we will see new highs in a few days to finish what looks like the W1 of a bullish W3 that started at 1294. I went long today at 1350 and will be using the rising TA as my stop if it is breached at any point. I also will sit down and calculate a target for May, which gets a bit more complicated as there is a coming correction of the wave from 1294 once this final impulse is over. But for now, I'd say it looks like we're going to have a very bullish year as long as the market keeps above the trend averages. I think we are finally seeing the start of a correction. However, what degree of a correction is the question. I favor a test of the TA, which is currently at 1344 and rising, before continuing upwards. I was ready to take losses (and gladly so given the events) today when I found about the Bin Laden news. But by the time the market opened, there was weakness so instead I just took some minor profit around 1360 and will be ready to go long when the next bullish wave resumes. On a side note, it was about time this guy was eliminated. It seemed strange to me that we had spent about $1 trillion in wars that started because of Bin Landen and yet this guy was still around. So even if his killing does not end the war or Al Qaeda, at least there is some closure to 9/11. Just too bad it took 10 years to do this. Ironically, the guy lived in a mansion near the capital of Pakistan and not in some hole in a mountain as many had led us to believe.